Tomorrow (Saturday) THE NEW BARKER will be heading to Dogs Dig Downtown Bradenton at the Farmer’s Market on Old Main Street. Photos with Santa from 9:30a-11:30a and then at noon there will be a Doggy Attire Contest with awards. 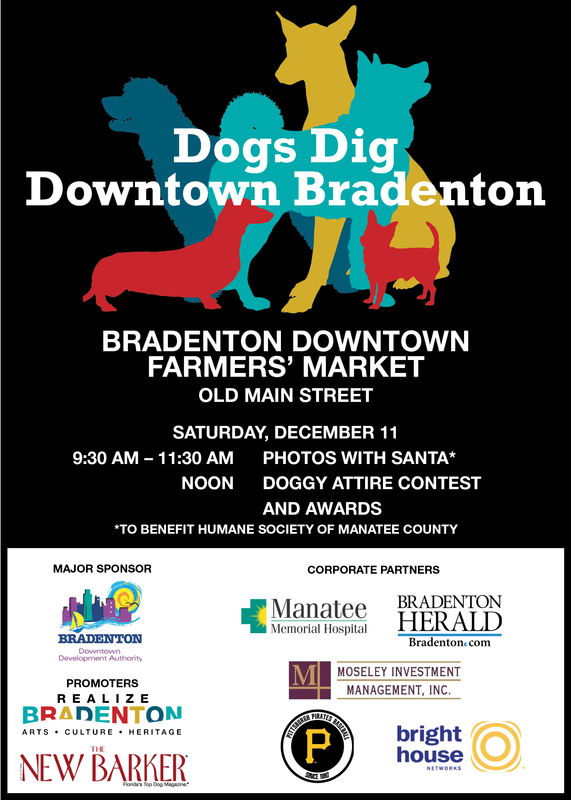 Benefits the Humane Society of Manatee County. THE NEW BARKER will also be in St. Petersburg on Beach Drive as the Museum of Fine Arts partners with the SPCA Tampa Bay to celebrate the mixed breed dogs. The Great American Melting Pot Dog Contest will take place at noon. If your dog is any kind of mix (and at least half of the dogs living in American households today are) then come on out. Contest categories include Best Dog Trick, Biggest and Smallest Lap Dog, American Melting Pot Idol, Biggest Owner and Smallest Dog/Biggest Dog. The contest sign up begins at 10. We’re also asking for donations of unopened cans or bags of dog and cat food. For your donation, the Museum of Fine Arts will give you a 20% discount on an annual membership. Ahhh, The Art of Dog is at work here. On St. Pete Beach, it’s a Christmas Parade featuring the Merry Bichons from the Suncoast Bichon Club. Afterwards, stop by Gone to the Dogs for some holiday cheer and very special, specials. Speaking of special, specials – a furry dogmother told us that 4th Street N in St. Petersburg is going to be a happening place tomorrow. Check out the dog-theme Christmas trees at Pawsitively Posh Pooch. And down the street at One Lucky Dog, they’ve reported to us that they’re having some special Holiday Savings Events for the next couple of days. On Sunday, December 12, THE NEW BARKER will be at Cappuccino Cafe’s monthly Happy Yappy Hour from 1p-4p. Great Pyr Rescue, those big, beautiful furry Christmas dogs will be the beneficiary of Sunday’s event. Live entertainment and your $5 donation gets you a glass of house wine. If we ask nicely, maybe the chef will serve up some kind of hot toddy too. Give her a call – 727.738.8009. On Thursday, December 16 at Hyde Park Village, Downtown Dogs co-hosts the HOWLiday Block PAWty. THE NEW BARKER has attended the last couple of these and they are alot of fun. Music, great food and beverages and it benefits the Humane Society of Tampa Bay. for more info, call Downtown Dogs at 813.250.DOGS. Stay warm and remember to dog responsibly. Previous Previous post: What A Difference A Dog Book Can Make. Next Next post: Just In The Nick Of Time.